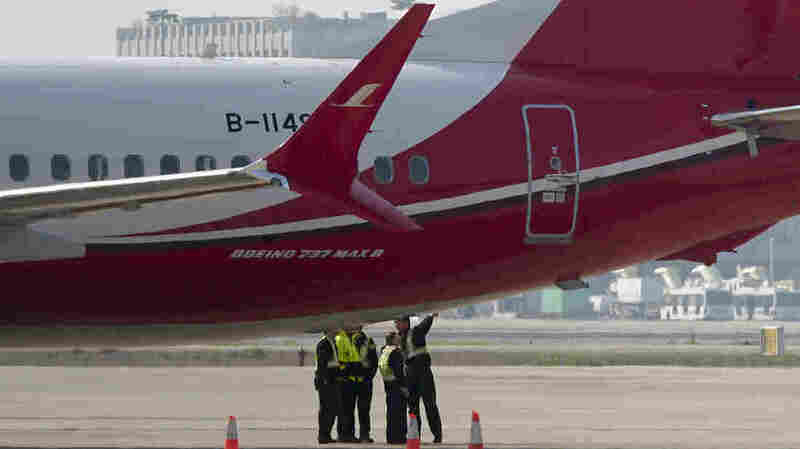 List Of Countries And Airlines That Have Banned The Boeing 737 Max 8 Sunday's deadly crash of a Boeing 737 Max 8 in Ethiopia is spurring dozens of countries and airlines to ground the plane. In the U.S., the FAA is demanding design changes for the fleet. Members of the ground crew chat near a Boeing 737 Max 8 plane operated by Shanghai Airlines and parked on the tarmac at Shanghai Hongqiao International Airport in China. On Monday, the Civil Aviation Administration of China ordered all the country's airlines to ground their Boeing 737 Max 8 planes after Sunday's fatal crash of the same model plane in Ethiopia. On Wednesday, the Federal Aviation Administration ordered the temporary grounding of the Boeing 737 Max aircraft operated by U.S. airlines or in the U.S. territory. This follows similar moves by airline regulators across the globe in the wake of Sunday's deadly plane crash in Ethiopia that killed all 157 people on board. The cause of the crash is still under investigation. In a statement, the FAA said, "the agency made this decision as a result of the data gathering process and new evidence collected at the [Ethiopian crash] site and analyzed today. This evidence together with newly refined satellite available to FAA this morning, led to this decision." Canadian Transport Minister Marc Garneau also announced on Wednesday that all of its Boeing 737 Max 8 aircraft were grounded and the jet was banned from entering Canadian airspace. On Tuesday, the European Union Aviation Safety Agency (EASA) announced a suspension of two Boeing 737 Max models in all flights in the European bloc. The Civil Aviation Administration of China on Monday ordered the country's airlines to suspend all commercial operations of their Boeing 737 Max 8 jets. In response to the FAA order and the wave of bans, airline manufacturer Boeing said that they were recommending the temporary suspension of operations of the entire global fleet of 737 Max 8 aircraft. Boeing's statement emphasized that they continue to have "full confidence in the safety" of the jets, but that they are supporting this step out of "an abundance of caution." Boeing says the company is "doing everything we can to understand the cause of the accidents in partnership with the investigators, deploy safety enhancements and help ensure this does not happen again." On Wednesday, Southwest Airlines said it was immediately complying with the FAA requirement and removing 34 Max 8 aircraft from scheduled service. American Airlines, which operates 24 of the planes, is working to rebook its passengers.